In 1830 carrier John Hewett departed every Thursday at 2:00pm for New Buckenham. Samuel Farrow is reported to have purchased the house in 1840. He was a timber merchant and is said to have had a brewery on the corner of the Green. It is as yet unknown when Y,C & Youngs became involved with the house. Recorded as a beerhouse in March 1852 when licensee William Ward was a witness to the arrest of 27 year old Henry Vince. Police constable William Lanham was on duty at midnight, February 13th 1852, when he heard of a riot at the Bell. Upon arrival Ward asked the constable to remove Vince from the house. A scuffle ensued and Vince threatened to knock the constable down. The constable tripped and Vince fell on top of him, almost biting though the constable's cheek. With assistance from the landlord Vince was arrested. The jury heard that Vince had been in custody twice before for breaches of the peace and a third time for desertion from the army. The sentence was six months' imprisonment with hard labour. 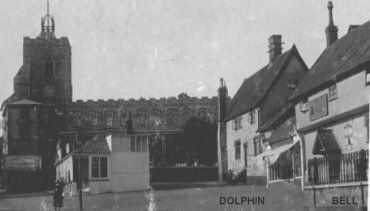 At the adjourned meeting held Wednesday 14th March 1906 licensee Albert Edward Saunders said that he had been at the house since Michaelmas 1905 and the house provided good accommodation and the sanitary arrangements were well conducted and in good order. He was selling three barrels of draught beer and about a gallon of spirits a week. The manager for brewers Youngs and Crawshay said that trade for the past three years averaged 143 barrels of beer, 60 dozen bottles of ale and 22 gallons of spirits. Trade had gradually increased over the last three years and the house was patronised by the working class. At the Licensing Session held Wednesday 16th March 1920, the owners Messrs. Youngs, Crawshay & Youngs agreed upon the closure of the BELL on the grounds of redundancy. The BELL was then selling 163 barrels of beer and 53 gallons of spirits a year. Demolished 1952 to make way for new Post Office building.